Based on data from StatCounter Global and reports from analysts, BlackBerry 10 has apparently been the shot in the arm that BlackBerry needed. On June 28th, the company will report its quarterly earnings which will cover the Canadian based OEM's fiscal first quarter. Just last week, two brokerage firms said that BlackBerry will top expectations with the number of BB10 units shipped in the quarter close to 5 million. The problem with Wall Street is that you have your strong bulls on the stock (Peter Misek from Jefferies) and you have your bears (Detwiler, Fenton). While Misek sees every piece of news coming from Waterloo as showing the glass half full, Detwiler Fenton has been more proactive with its bearishness. The investment house's analyst, Jeff Johnston, reported in April that more BlackBerry Z10 models were being returned than were being sold. We've tried to contact the firm and have left messages for Mr. Johnston a number of times without getting a response. 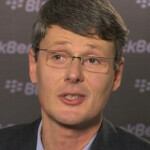 No evidence at all ever emerged that supported Mr. Johnston's report, which was denied by BlackBerry. The OEM eventually filed a complaint against Detwiler, Fenton with U.S. and Canadian securities regulators. According to StatCounter, as of Sunday, BlackBerry occupied the Avis position (number 2, but they try harder) in Canada with about 27% of that market, compared to the approximately 48% owned by iOS. Android is third with 22%. But that is BlackBerry's home market. Let's look at the U.K. There, the platform is running a decent third with about 18% market share. That compares with the 44% owned by iOS and the 30% controlled by Android. In South Africa, BlackBerry is actually on top, closing in on a 40% share. With about 18%, Series 40 is next while Android is third with a 14% slice of the pie. That is actually no surprise as we've told you in the past about the support the platform has in the country. The company was voted the coolest brand of the year last year, by kids in the country. The next two quarterly reports are huge for BlackBerry just to see if the company is turning around like these numbers suggest it might be. But despite some signs of momentum, BlackBerry does not have an identity right now and that is dangerous. In its battle for third place with Windows Phone, the latter is now seen as providing above average cameras that take great low-light pictures. BlackBerry once could be called the businessman's smartphone, but no longer. So the challenge for Thorsten Heins is to develop a brand identity for his handsets. Any ideas? OS marketshare in the U.K.
BIS is the reason. U kno data it is expensive here in SA. Good job BBRY. It's a slow but make it a steady comeback. Its like Chrysler in the US. Makes terrible cars, but MURICA.